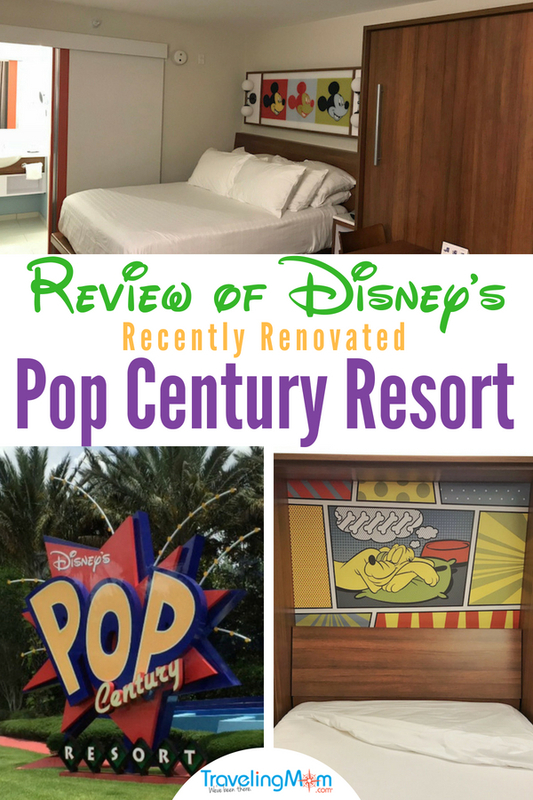 The Pop Century Resort is a vibrantly themed Walt Disney World Resort that is a great value for families on a budget. 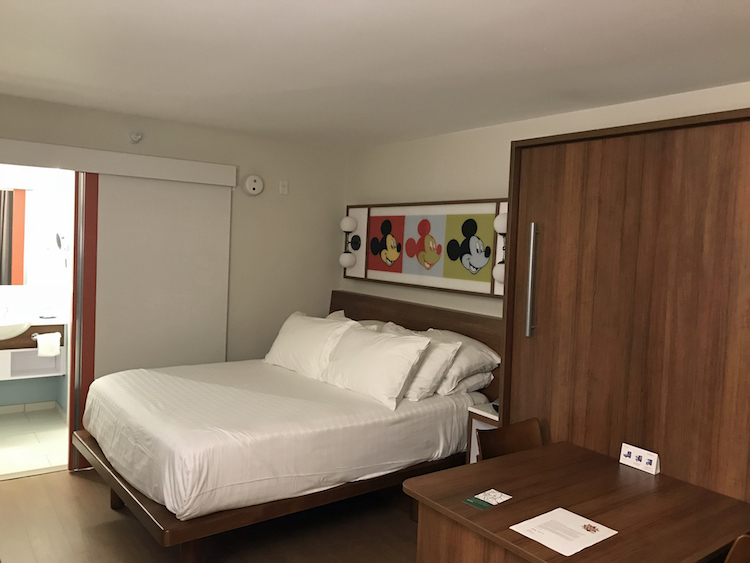 The recent room renovation makes a stay at Pop Century even more magical. 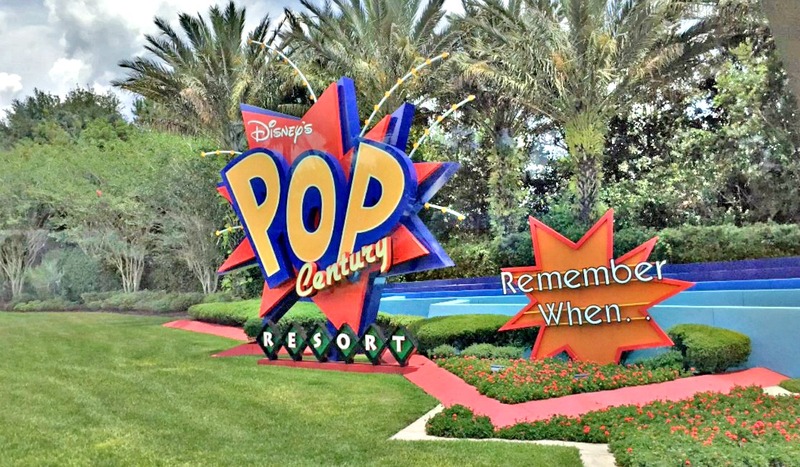 Pop Century is a popular value priced resort at Walt Disney World. Its theme is pop culture fun from the 1950’s through the 1990’s. Located in the ESPN Wild World of Sports area, this resort is closest to Disney’s Hollywood Studios theme park. Every room comes with a mini fridge, free wifi and lots of USB charging outlets. Rooms now have 2 queen beds instead of 2 double beds. The food court is an easy walk from just about every room and offers a variety of food options. Despite it being a value resort, there are plenty of activities scheduled, including a nightly Disney movie. You’ll also find a splash pad, playground, and arcade. 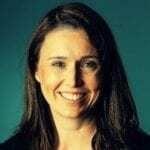 Families of 5 or more will have to book a 2nd room or stay elsewhere. There are no water slides or spas at value resorts. Currently offers only bus transportation to the parks. At the resort, there are 10 different buildings separated and themed by decades. The buildings have outdoor hallways with elevators located near the center. The main hall houses registration, the gift shop, the food court and an arcade. 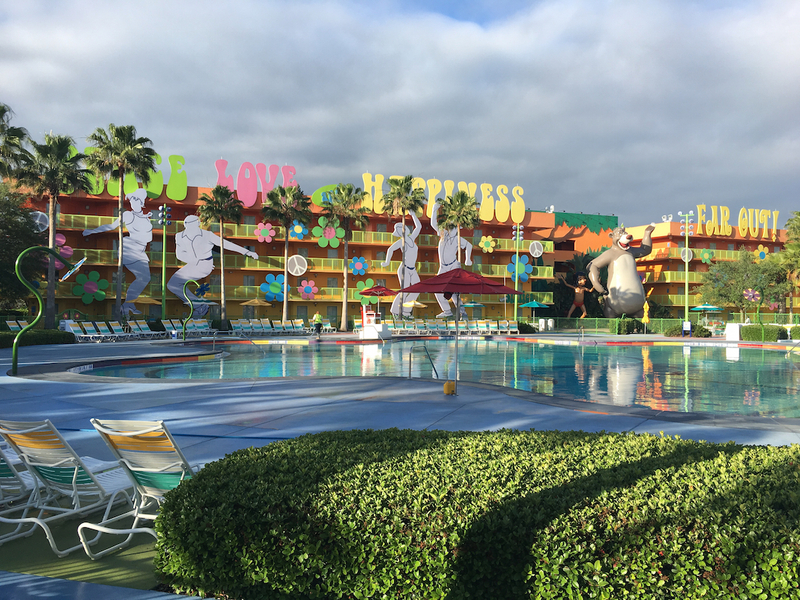 The main pool is the Hippy Dippy Pool, located in the 60’s section of the resort, directly behind the main hall. This is where you will find pool activities and a pool bar. There are 2 other pools, the Computer Pool near the 80’s and 90’s building and the Bowling Pool near the 50’s buildings. The Hourglass Lake separates Pop century from the Art of Animation Resort. A short walk across the Generation Gap bridge will take you to the other side; the walk is less than 5 minutes from resort to resort. While they don’t allow you to pool hop, there is a fun playground near the pool that my boys enjoyed. 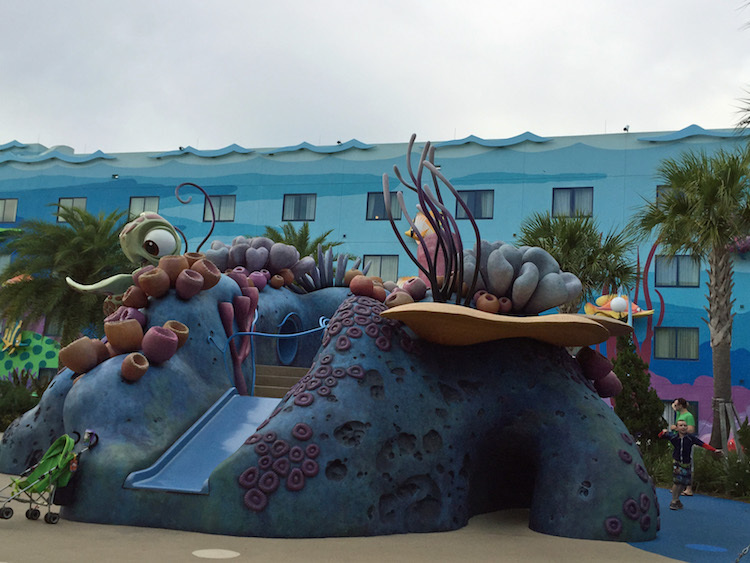 Plus Art of Animation is a really fun resort to explore with kids. It’s themed in sections by animated movie. You’ll find Finding Nemo, Cars, Lion King and Little Mermaid sections. The biggest benefit of heading across the lake is checking out the Art of Animation food court. They have different food choices, making it worth your while to “pop” over for a meal. The food court was the biggest benefit (besides a much cheaper price tag) for our family when staying at Pop Century. We moved from a Deluxe resort, Yacht Club, which was an amazing place to stay although pricey! At Pop Century, it was easy for me to pop over to the food court each morning to grab a drink with my refillable mug at the food court. Plus the very nature of a food court means there are plenty of food options. Everyone was able to find something they liked. The food was decent, exactly what we’d expect from a food court. We don’t do a lot of sit-down meals at Disney, so the food court option worked well for us. 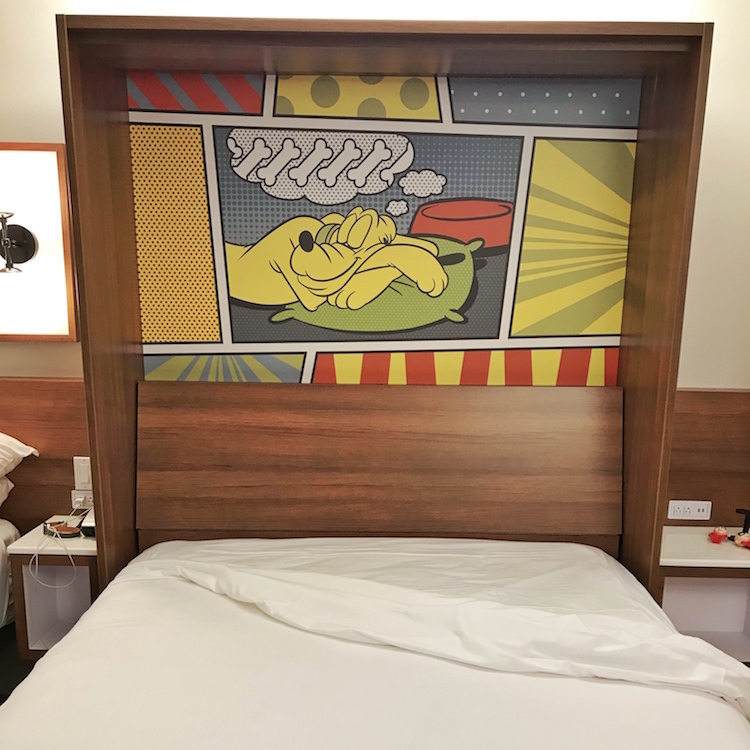 Disney recently finished renovating all the Pop Century rooms. Instead of two double beds, each room now has a regular Queen bed with a Queen Murphy style bed next to it. A limited number of king beds are still available. This is a major improvement from the previous double/double configuration. In addition, the Murphy bed turns into a dining table when not in use. The update also includes better storage and organization throughout the room. I love how bright and airy the rooms seem with the new furniture and decor. There are a few Disney details mixed with pops of color, making the theming much more appropriate for a resort named Pop Century. The bathroom now has a barn door to separate the room from the sink area. 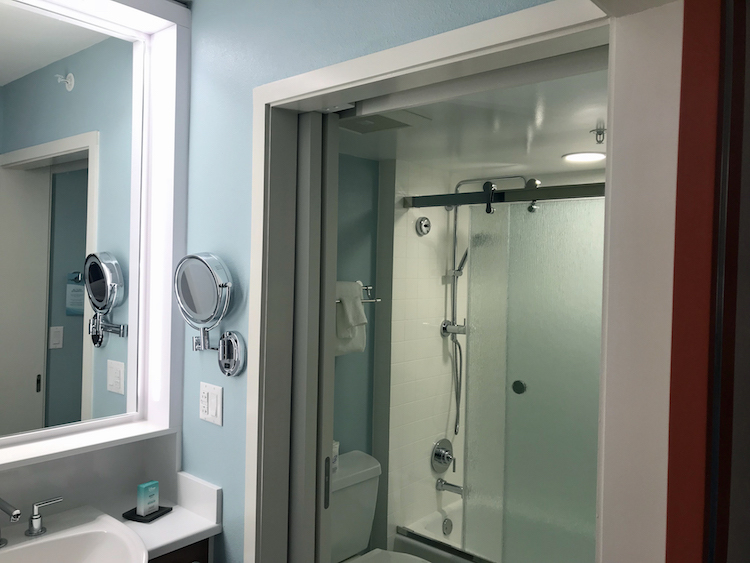 The shower/tub combo has a 3 piece shower fixture that includes a rain-style showerhead. Large mini fridge with clear glass door. The carpet was replaced with hard floors. Plenty of USB charging outlets on both sides of the room. Currently, Pop Century only offers bus transportation to and from the parks, unless you opt to pay for the new Minnie Van service through Lyft. The one benefit to their bus transportation is that it doesn’t share buses with other resorts. 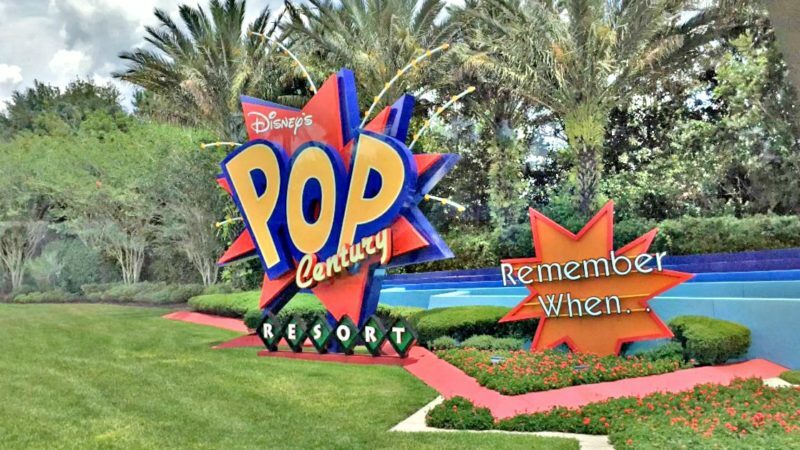 Disney recently announced a new resort transportation option coming to the Pop Century, Art of Animation and Caribbean Beach Resorts. Disney Skyliner will connect those three resorts to the International Gateway at Epcot via gondolas in the sky. We do not know when this project will be up and running. All Walt Disney World Resort guests can take Mickey’s Magical Express transportation to and from the Orlando airport. Keep in mind they do require a departure from the resort 3 hours prior to your flight time (4 hours for international flights) even though it’s only about 30 minutes to the airport. WDW resort guests also have access to Extra Magic Hours in the parks. Unlike Disneyland which only offers extra magic hours in the morning, Walt Disney World guests have access to later nights in the parks as well. The best part of Pop Century is its overall value. It’s a Walt Disney World Resort with all the benefits and fun theming without the hefty price tag. If you are looking for an upgrade, check out our favorite moderate resort Disney’s Port Orleans Riverside. We were just at Pop Century a few months ago. Pop Century is our go-too resort when we visit Disney. 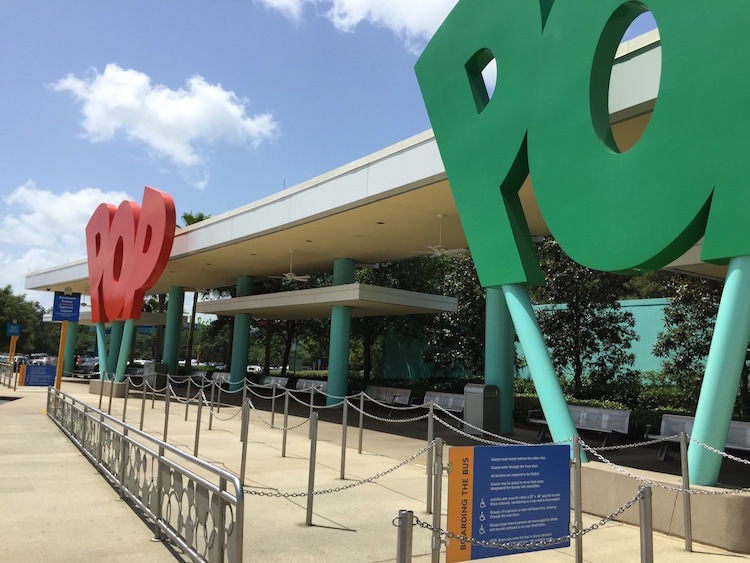 For us traveling with a toddler, the compact nature of the resort and the fact that the buses only service Pop Century are the two biggest positives. With a 3 year old, not having a table service restaurant or water slides is not a deal breaker.